For those of you not on the East coast and obsessively watching The Weather Channel, we’re batting down the hatches along with the entire seaboard and settling in for what, hopefully, will not be the snowpocalypse/gale-force-winds/deluge that’s predicted. Over here in Roanoke we’re a little more shaded from the brute force of hurricane Sandy, but who knows what will happen on Monday/Tuesday as the storm rolls in. Crazy town winds upwards of 50-70 mph? Rain? Even snow given our elevation? I’m just hoping that the power stays on and the trees stay upright. But preparing for an early winter storm calls for soup, doesn’t it? Since we’re trading the 80 degree, sunny weather for something a bit more fall/winter-ish, I wanted to celebrate some of the best flavors the seasons offer–root vegetables, apples, spices, and a bit of citrus. 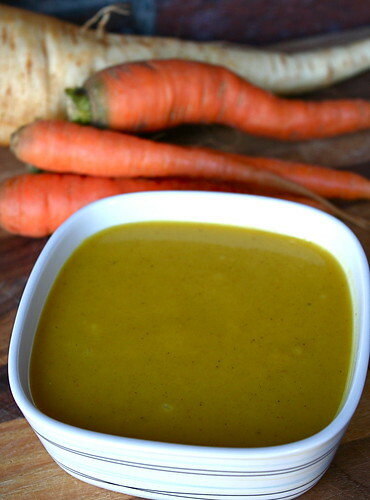 This Curried Carrot Parsnip Soup embodies everything I love about the Moosewood Restaurant Low-Fat Favorites, it’s simple, flavorful, and, miraculously, really darn healthy without subbing lots of weird ingredients (anyone else hate the ‘low-fat’ marketing of processed, sketchy ‘food?’). Unlike some of the cookbooks I’ve featured this week, I’ve actually cooked a fair amount out of this one. The Brown Bread, a molasses-laced cornbread, is my go-to winter quick bread to eat with soups (would be divine with this one! ), the Indian Chickpea Spread is a great hummus alternative and perfect for snacking during football season, and the Middle Eastern Tofu-Stuffed Peppers make for a great fancy entree to serve for guests. On my to-make list? Definitely the Sweet & Sour Lentils, New England Squash Soup, and Vegetable Filo Roll Extravaganza. For some reason, the recipes strike me as fall/wintery, so it’s a book I tend to pull out during the last and first few months of the year. I’ve yet to make a bad dish from it and, while I’m not a low-fat, calorie-counting kind of girl, it’s nice to know that every now and then I’m focusing on something with less oil or coconut cream and the like. As for the Curried Carrot and Parsnip Soup itself? It’s a home run recipe for both G & me. It’s different than the blended soups I tend to make (which almost always feature coconut milk/cream) and I love the brightness the apple cider and orange juice brings to the dish. The Indian spices aren’t overpowering, but they give a bit of warmth and the root vegetables are hearty enough to make this a filling bowl of soup. I had more parsnips than carrots on hand, and it turned out great, so whether this is more carroty or parnsipy, I don’t think it matters–it’s just darn good. And perfect for riding out a storm. To all of my friends/bloggers/anyone else who is on the seaboard, my thoughts are with you and I hope this storm peters out a bit. Hopefully I’ll be back to finish out the rest of MoFo, but in case I’m absent, I’ll return as soon as the power does! In a Dutch oven or stockpot, warm the olive oil over medium heat. Saute the onions for 3-5 minutes, until translucent. Add the garlic, ginger, salt, cinnamon, turmeric, coriander, cumin, and cayenne and saute 30 seconds more, until fragrant. Pour in the apple cider, stir to deglaze the pan. Add the vegetable stock, carrots, and parsnips. Stir and cover. Bring to a boil, the lower to a simmer, and simmer for 20 minutes, or until the vegetables are soft. 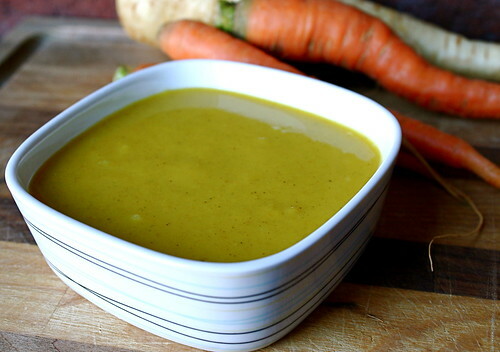 Transfer the soup to a food processor or blender (you may have to do this in batches), and add the orange juice, lemon juice, and salt & pepper to taste. Blend until smooth. Gently reheat if necessary. Talk about comfort food- That soup looks perfectly creamy, warming, and definitely soothing. Despite the fact that I’m not the biggest fan of parsnips, I really wish I had a bowl of it right now, in fact! Yum! I love a pureed soup. Stay safe, Jes! So far, we just have a wind advisory here in Atlanta. I’ll be thinking about my northeast peeps this week!! This sounds like a lovely hearty soup! Hope the weather isn’t too rough where you are and the power stays on.